Today I’m going to be sharing my first impression on the Klairs Freshly Juiced Vitamin Drop that was so kindly sent to me by BeautyBarn (India) to review. Well, right off the bat, I fell in love with the packaging! The bottle is housed in a white cardboard box that has the most interesting and trippy holographic design on it…very difficult to photograph well though! The vitamin drops (serum) is packaged in a clear plastic bottle that once again has the same beautiful holographic sticker around it. The bottle also has a dropper top, which I really appreciate, because it makes it so much easier and hygienic to use the product. 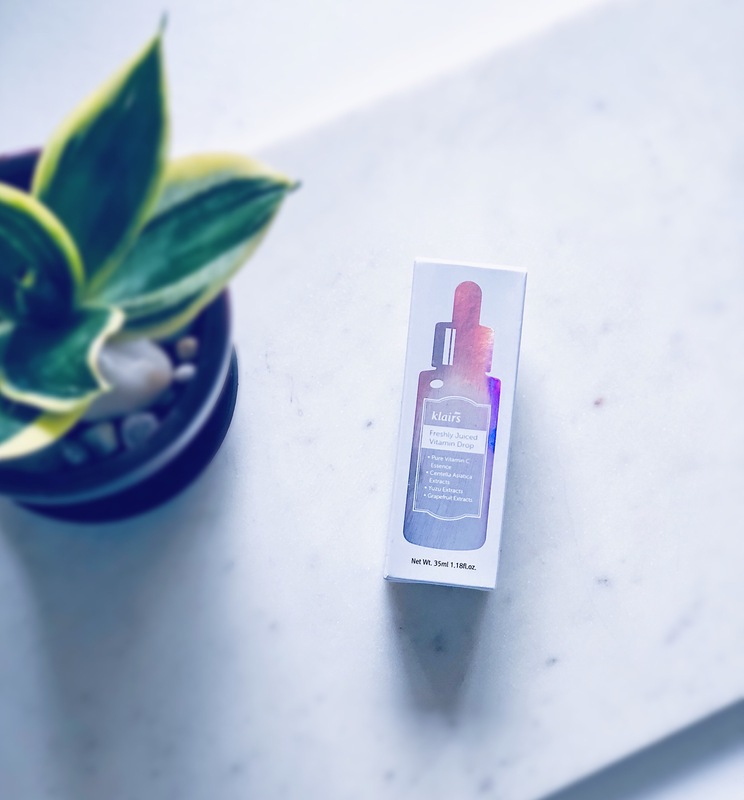 Now I know that Vitamin C oxidises when exposed to light and can go off rather quickly, however, Klairs claims that the Klairs Freshly Juiced Vitamin Drop is made from a ‘Hybrid Stabilization Technology’, which ensures that the serum does not degrade even if left out in the open. Having said that, I don’t wish to take any chances with this product, so I store my Klairs Freshly Juiced Vitamin Drop in the refrigerator! I also love the texture of the vitamin drops and I feel like the percentage of Vitamin C in this product (5%) is so good and balanced that it will be perfect for even those of you who have the most sensitive skin. I won’t be going too much into details in this post, because I plan on doing a detailed review of the Klairs Freshly Juiced Vitamin Drop and for that I will continue to use this product for at least 6-8 weeks before I give you my final thoughts. Also, I am documenting my acne progress on a daily basis and will include that in my detailed review, so stay tuned! Until then, let me know if you have tried the Klairs Freshly Juiced Vitamin Drop and what are your thoughts on it 🙂 Also, if you’re looking to buy the Klairs Freshly Juiced Vitamin Drop in India, then check out BeautyBarn and place your order NOW! Packaging is a major impetus for me to buy. The product does the trick after that! Looks like they got many things right for them! I couldn’t agree more with you. Packaging is what gets my attention, especially when it’s a product I’ve not used before. I thinks Klairs is very clever with their packaging… their products are fantastic too though (there’s no doubt about that!). I used the Klairs Freshly Juiced Vitamin Drop n it broke me out. SO I stopped it. Now again after doing some research, I tried using it alternate days so that my skin gets used to it but I broke out again. Can you please help me in understanding if & what I am doing wrong here. Should I use it again & let my skin purge before it works for me.